Computex is always a big stage for mobile device launches, and Taiwanese manufacturers always seem to bring a little bit extra to their home technology expo. Acer’s press event at Computex 2013 took place earlier today, where they announced some interesting new Windows 8-based devices. The most notable has to be the Iconia W3 tablet, the first sub-10” device we’ve seen running the latest variant of Windows. We’ve known of the W3’s imminent arrival for some time now, but its no less significant of a launch because of it. It’s a Clover Trail-based Atom slate with Windows 8, an 8.1” 1280x800 display, and a bundled copy of Office Home and Student 2013. Internally, the W3 runs on Intel’s 1.5GHz Atom Z2760 SoC, which we’re very familiar with at this point after dealing with it inside a number of different Windows 8 tablets in the last six months, along with 2GB of DDR3. It’s also got a 2MP rear-facing camera (at that resolution, why even bother? ), a single USB port, and 8 hours of battery life. It’ll hit store shelves later this month priced at $379 for a 32GB model, which also makes it the least expensive Windows 8 tablet we’ve seen thus far and undercuts the street pricing of the 64GB ASUS VivoTab Smart by about $50, plus the added cost of Office. The 64GB W3 comes in at $429. A Bluetooth keyboard accessory will also be available. The W3 is an interesting return to the days of UMPCs, when pocket-sized Windows devices seemed like a legitimate possibility. Back then, the devices were thick, slow, and had terrible battery life, but with the advent of low-power x86 chips, the hardware concerns have been fixed. The W3 comes in at a light 1.1lbs, though the 0.45" thickness is a bit more than we're used to seeing in modern tablets of this size (it's about 60% thicker than the iPad mini). Obviously, the Bay Trail version is the one to wait for, and we already have concerns about the display - it’s not an IPS panel, and reports have pegged it as “needing work” - but the W3 represents a step forward for Windows tablets. 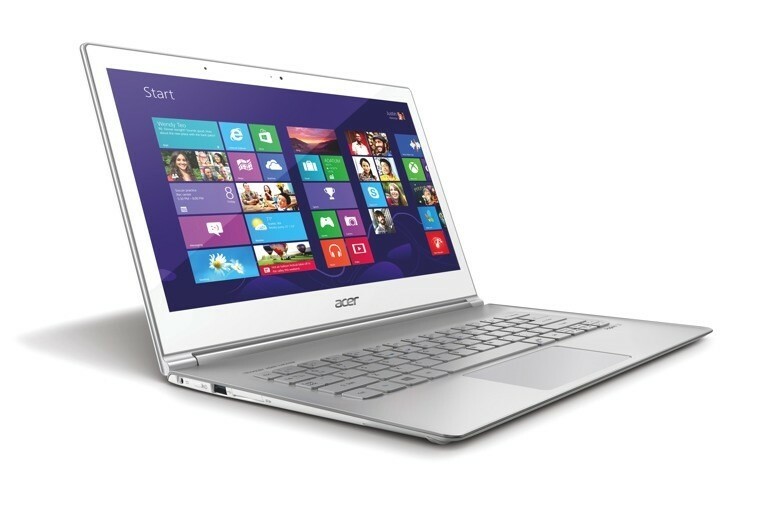 Acer has also updated their flagship Aspire S7 ultrabook with Haswell processors, a WQHD touchscreen display, and improved battery life. It’s had a mild industrial design freshening, with a new unibody aluminum chassis (still a Gorilla Glass lid), along with revised cooling design and a newly refined keyboard with an updated layout and deeper keystrokes. It’s still a remarkably thin computer, at just over a half-inch thick and 2.86lbs. Haswell and WQHD touchscreens are going to be template for ultrabooks going forward, and we’ve already seen ASUS announce the Zenbook Infinity with similar specs. The 10-point capacitive multitouch 2560x1440 IPS display is undoubtedly going to be a very high quality panel, though the Windows experience will be a question. It wasn’t particularly good on Toshiba’s KIRAbook, and I’m skeptical of how Windows responds to UI scaling at high DPIs in desktop mode. The 11” model has been dropped, and the S7 will ship in July at similar price points to the original S7 (MSRP, not current street pricing). There’s also a new Aspire S3 Haswell-based ultrabook, basically a lower end version of the S7 with similar design language, a completely aluminum chassis (no glass on the lid), and a slightly thicker and heavier chassis - though at 0.7” thick, it’s still pretty slim. 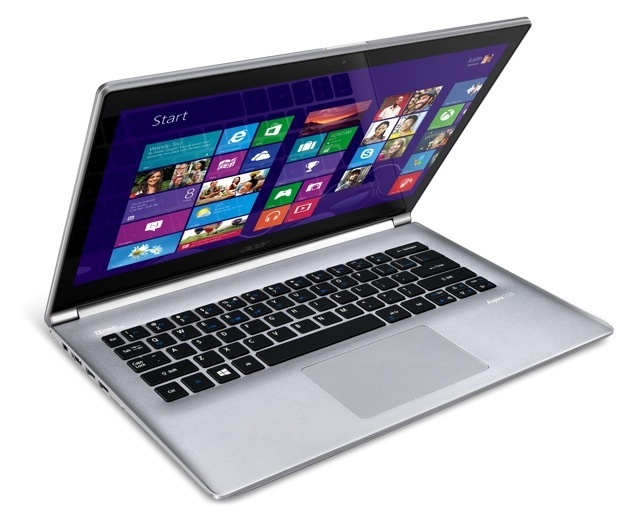 The 3.67lb weight is pretty high for the ultrabook class of notebooks, but that can likely be attributed to the optional GeForce GT 735M dedicated graphics. This will not be the only instance in which we’ll see an OEM go with Haswell plus a low-end dGPU for ultrabooks instead of a Crystalwell Haswell GT3e part. The S3 comes with a 1080p IPS display panel and hybrid storage, offering a large storage drive and a solid state cache in place of the purely SSD storage of the S7. Price points are appreciably lower at around the $1000 mark, with the S3 also shipping in July alongside the S7. We’ll have more to say about the new Acer systems in the coming days, along with much more coverage of Computex 2013. According to The Verge the W3 weighs 1.1 pounds. I think it's a worthwhile data point to include. What's the continuing obsession with over-res'd 13" screens? Seriously, 15" factors outsell 13" factors and these guys aren't bringing out thin and light fifteens. Yup, that's the crux of the issue with Win32 and the solution is compromise. IPS and proper tuning (color, contrast, etc.) at a modest resolution can result in a quality display that aids the Win32 deficiency while increasing battery life and decreasing BOM.